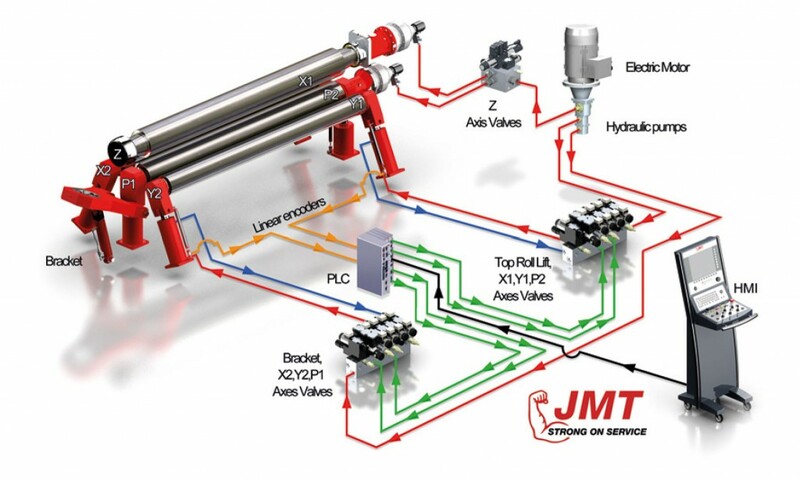 The mechanical and hydraulic systems on JMT PR4H machine are designed by our experienced engineers. These engineers design the machines utilizing parametric 3D engineering technology as well as implementation of mechanical and static analysis. 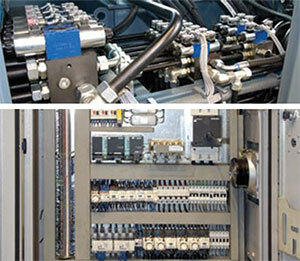 All mechanical, hydraulic, and electronic systems are designed and tested by electrical and mechanical engineers. Only following lengthy tests and evaluations are the machines authorized to be manufactured in serial production. The side rolls are guided by a rectilinear system that moves them in a straight line direction (instead of the curved path of planetary guides) giving them the strength to pre-bend and rolling heavy plates. 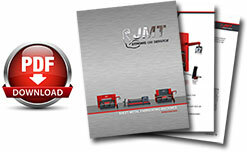 Because of its high torque drive, a JMT machine bends the part with fewer steps. Rolls are powered by independent high torque hydraulic motors and planetary gear boxes. The activation system is positioned on the same axis as the roll, so high torque is transferred to the sheet without any power loss. Especially during the pre-bending, the hydraulic breaks does not allow the plate to slip back which may create safety problems. • Four roll plate rolls are more precise, productive, versatile, faster, safer and easier to operate than three roll machines. They are less dependent on operator competence. They are ideal for bending plates up to 90 mm thick. • The fastest and most accurate bends are made by four roll machines. The plate is held securely in place between the top and bottom rolls while the side rolls move vertically to create the bend. • The bottom roll moves up to hold the plate edge securely against the top roll while the side roll is raised to form an accurate pre-bend,minimizing the flat zone on the plate edge. Pre-bending on a three roll machine requires that plates be tilted down as they are being fed. In contrast, plates are loaded horizontally at the feed level for pre-bending on a four roll machine, which allows the ake place on either side of a four roll machine. If fed from only one side, they can even be placed up against a wall to save floor space. • The side rolls are positioned to the right and left of the bottom roll and are on their own axes. The independent axis of each roll helps make a perfect bend. The “back” side roll (at the far side of the feeding point) also functions as a back gauge to square the plate for proper alignment. This eliminates the need for someone to assist the operator. • The plate is kept square without slipping during both pre-bending and rolling because of the constant secure clamping of the top and bottom rolls. 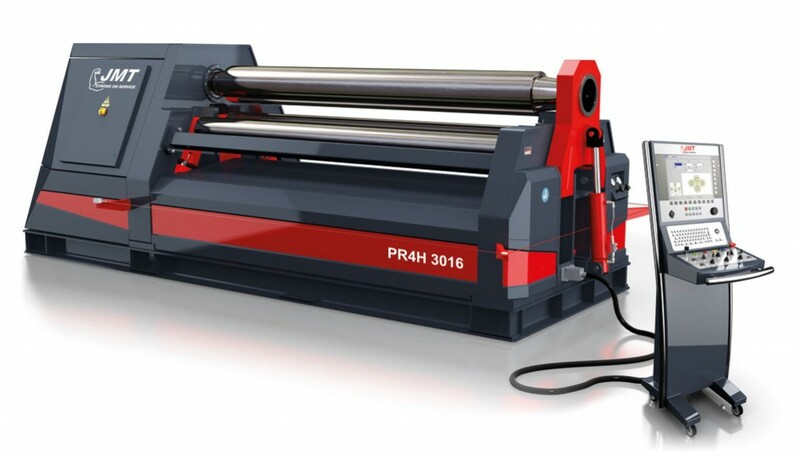 • Four roll machines do not require the operator to remove, flip, and then try to square and reposition the plate a second time after first pre-bending,as is the case with three roll initial pinch machines. Keeping the material in the machine makes four rolls 50% more efficient than three roll initial pinch machines, and allows a cylinderical shapes to be rolled to the required diameter immediately following pre-bending. • Bending the back edge takes place after the rolling process, for a one direction and single pass operation. This process provides less working area. • Four roll machines are the only type of plate rolls that can effectively make use of NC and CNC controls. Because of the constant clamping and driving of the material during all steps of rolling. Bending complex shapes like polycentric or elliptic work pieces can be easily done with JMT four roll machines. The rolls are guided with spherical roller bearings. This guidance system requires less lubrication and assures long-term precision. The most important element of a plate roll is the rolls themselves. 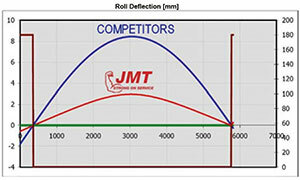 Most machines in the market have weak rolls that deform during the bending process when small diameters of 5x the top roll are reached JMT uses high tensile carbon steel rolls that are machined by high precision CNC lathes. Working surfaces of the rolls are CNC induction hardened to HRc 52-58 (5-6 mm deepness) with hardness tests performed at varying points on the rolls. Rolling 1.5 x top roll diameter is acquired easily. The rolls are machined with a crown to compensate the deflection of the rolls during the bending process. Special Crowning for other materials can be applied free of charge when ordering. Machine movements are provided by hydraulic components. The precision on the all axes are acquired by world leader Parker valves’ high speed response ability. And pressure safety valves used against peak pressures and overload provides protection for motors and other components. Electrical system designed compatible with CE safety regulations. The system consists of well-known electrical components such as Siemens, Schneider, Phoenix, Koyo and Opkon.The system is protected by current overloading for its components’, power supplies, electronics and motors. Control Unit used from world leader Esautomation from Italy. The bottom and side rolls are positioned by six different strong hydraulic cylinders. Adjustable pinching pressure compensation allows the rolling of different thicknesses of material with minimum deformation. Synchronization between the rolls are acquired by linear encoders and PLC. The PLC’s respond within milliseconds due to high precision proportional valves.